Show off your apprication for the 80's with this hip tee. 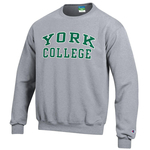 Our Champion sweatshirt has York over 1787 over College on the chest. This Champion short sleeve has York over 1787 over College on the chest. Comes in Sports Grey. 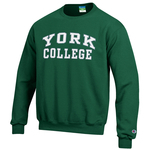 Standard crewneck sweatshirt with screen imprint of York College on front. Screen-printed graphic on the front of the hoodie, rib knit trim at neck, cuffs, and waist. Champion Jersey Long Sleeve Tee with a crew neckline and long sleeves, soft cotton blend material, and relaxed fit. Champion ladies* banner 1787 tee features a set- in neck rib, with a heat transfer label on the back of the neck. A feminine* cut rib knit at the neck, cuffs, and waistband. Quarter zip jacket with embroidered YC logo on left chest. Champion ladies Rochester Slub baseball tee features raglan 3/4 sleeve in a contrast color and a baseball style hem. Ladies* endurance shorts with 3" seam, side pockets, and champion logo on left hip. 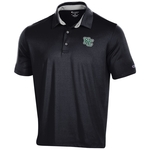 Champion solid-color polo features ultra-soft micro-knit fabric wicks sweat, controls moisture buildup to keep you cool and dry, full athletic fit gives you plenty of room to move, and details provide a clean finish. Champion mesh shorts feature lightweight breathable material to keep you dry and comfortable.